GreenBroz Trimmer for Sale - 420/215 - Save Big! - FREE Shipping! If you have any questions or would like to see a demo at our Denver store give us a call at (303) 362-1873 or email us at customerservice@thetrimmerstore.com. If you’re looking for a Greenbroz trimmer for sale then you’ve come to the right place. We carry both the 215 and the 420. It’s not uncommon to hear our customers say this dry trimmer is the first one they have ever been impressed by. If you’re looking for the GreenBroz Alchemist just click the link. GreenBroz Inc begins its story with some of the most innovative and functional designs in the dry trimming industry. Their number one goal was to create a trim machine that would preserve trichomes and provide you with better post-production material. What makes the GreenBroz so awesome is the fact the nugs roll gently across the blade instead of tumbling and dropping from the top of tumblers (most machines have tumblers). That is what we call “zero drop.” Trichome preservation at its finest and this is what gives you the hand-trim quality cut every time. You’ll get the best results with nice dense nugs at about an 8% moisture level. These machines don’t work well with larf. The GreenBroz trimmer price will vary between $6,300 – $11,760. GreenBroz 215 Dry Trimmer: The GreenBroz 215 dry trimmer will do up to 4 pounds of material per hour. It’s super quiet and is a perfect machine for home growers. Hand-trim quality all day long. 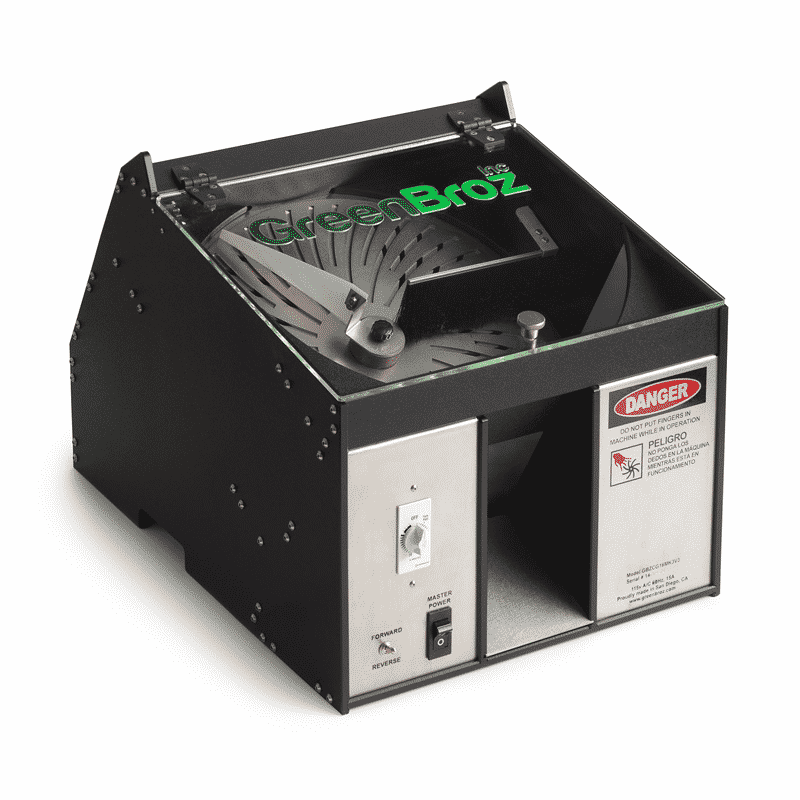 GreenBroz 420 Dry Trimmer: The GreenBroz 420 dry trimmer will trim up to 15 pounds of material per hour. HUGE! It also comes with VARIABLE SPEED! The control you have will enhance trichome preservation and give you better post-production material. Why Buy a GreenBroz From The Trimmer Store? Let’s face it, you can buy a GreenBroz trimmer almost anywhere these days. But have you ever thought about what you are actually getting? I mean seriously if you get a great deal that’s only half the battle. You still need expertise on how to run the machines in order to get the best post-production results. You’ll notice quickly that most vendors do not have the experience to get you what you need. Here at The Trimmer Store, you’ll get exactly that. Trust us, it’s a good feeling when our customers walk out the door knowing they have the right machine for the job. Give us a call today and we’ll take good care of you. For our Denver store click here. If you’re looking for a portable lightweight machine, the Green Broz 215 Standard is an excellent choice. It’s about the size of an old-school desktop PC. 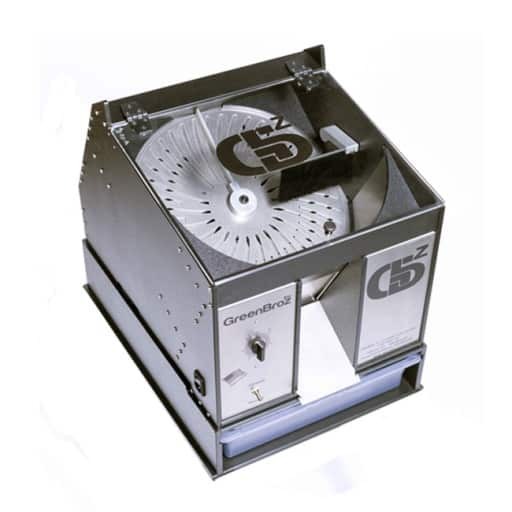 This Dry Trimmer processes up to 4 pounds of dry flower per hour! This is one of our best machines here at The Trimmer Store. The 420 Commercial is still GreenBros best dry trimmer. Almost twice as large than its little brother. You can easily go into the 15 unit per hour range, which is massive for any high-end grower. It comes with heavy duty stainless steel stand. Both machine’s housing is constructed from HDPE. If you know what a cutting board is then you know the material. There is no chance for microbial or bacterial growth, which is super important. Each model comes with a very efficient conveyor motor. These are unbelievably quiet and operate at low watts: 25 (Standard) or 40 (Commercial). Is this inquiry for rentals, parts or purchase related?